Coach Cook and three (3) Lady Hornets traveled to Oklahoma City this weekend to compete in the annual Folkstyle Nationals hosted by the USMC. 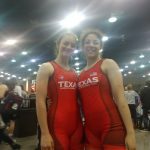 Hanna Brisher, Jade Ballew and Kiya Jones all grappled for a national title. They wrestled girls from around the United States. Kiya Jones came out on top of the weekend wrestling duals. 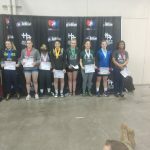 Kiya placed sixth (6th) overall and is a National Wrestling champion. Congratulations to you all!